Meanwhile, the Congress-led grand alliance has allotted the seat to the TJS party's Bhavani Reddy, a seemingly unknown rookie. The Bharatiya Janata Party (BJP) is going all out to ensure it puts up a tough fight against incumbent Siddipet MLA and Telangana caretaker Irrigation Minister T Harish Rao, one of the Telangana Rashtra Samithi's (TRS) tallest leaders. At the entrance of Siddipet town, a temporary party office has been set up and is abuzz with activity. 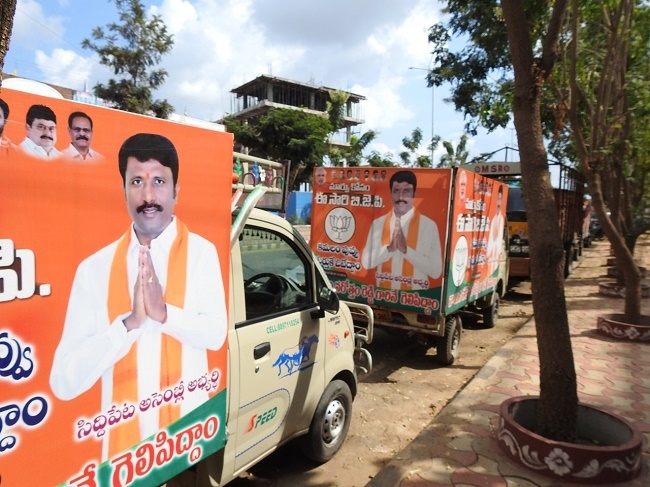 Eight to 10 vehicles decorated with the faces of BJP leaders, including the state party chief Dr K Laxman and Prime Minister Narendra Modi, their logo and their trademark saffron colour are ensuring that they take turns and do continuous rounds of the city. Local BJP leaders say that a similar exercise is being undertaken in the rural areas in the constituency as well. Up against Harish Rao, who is also the nephew of incumbent Chief Minister K Chandrasekhar Rao and has been with the party since its inception, is Naini Narottham Reddy, the BJP's district president. While the TJS has fielded Bhavani Reddy, seemingly a rookie, the BJP has also fielded a fresh face and say that they have already done the necessary ground work. "We are confident of a win and we have been working hard on the ground and the voters are with us," says Sandeep, a local BJP karyakarta. While Naini is a long-time loyalist of the party, who has worked his way up the ranks, he is far from a well-known face like Harish Rao. 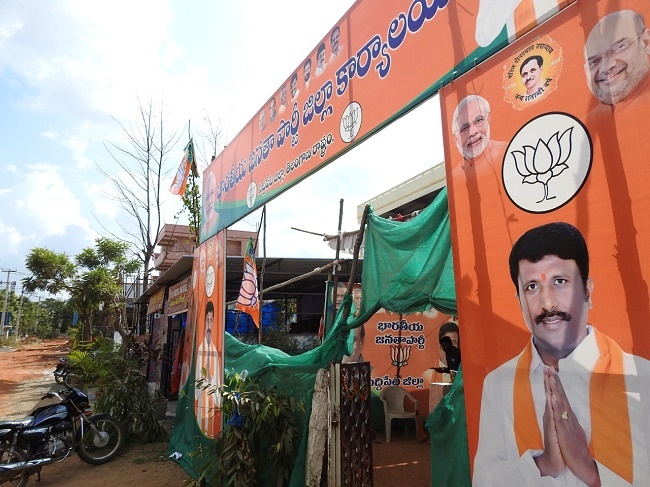 Most BJP members are hoping that Naini being a Siddipet native, combined with Narendra Modi's image, should be enough to help them sail through. However, Harish on the other hand has never lost an election and has held the Siddipet seat since 2004, with his majority only increasing with each passing election. Raju, a member of the Bharatiya Janata Yuva Morcha (BJYM), says, "Harish Rao has become arrogant due to his power and we are campaigning against his confident claims that he will win." "The leader aspiring for re-election in Siddipet is spending more time in Gajwel constituency campaigning for KCR, than for himself," he adds. At the BJP office, a number of young men can be seen gathering in and out of a room where Naini is seated as he chalks out a strategy for the upcoming polls scheduled for December 7. Speaking to TNM, when asked about what the main issue of the campaign was, Naini says, "Harish Rao has further suppressed those without a voice and he has filled the stomachs of contractors. He has taken kickbacks from all major irrigation projects in the state that came up over the past four years. That is what we are seeking to communicate to the voters and we hope that they give him an apt response." When asked if the BJP was sure of a victory, Naini told this reporter, "If we were not so confident, we wouldn't be here talking. We are sure that the people will vote him out and vote us in." Meanwhile, the BJP candidate has come to the notice of the TRS, as they lodged a complaint against him on Saturday with the Election Commission, alleging that he had asked for votes based on caste, specifically asking the Reddy community to vote for him. TRS General Secretary Sreenivas Reddy, who met Chief Electoral Officer Rajat Kumar, also submitted a video of the speech, which allegedly violated the rules laid down by the EC. Telangana will go to the polls on December 7 after the Legislative Assembly was dissolved ahead of its tenure on September 6 this year. The counting of votes will take place on December 11.